Murrieta Police are searching for a suspect who fired a handgun from a car into another vehicle Monday afternoon, causing minor injuries to the driver. 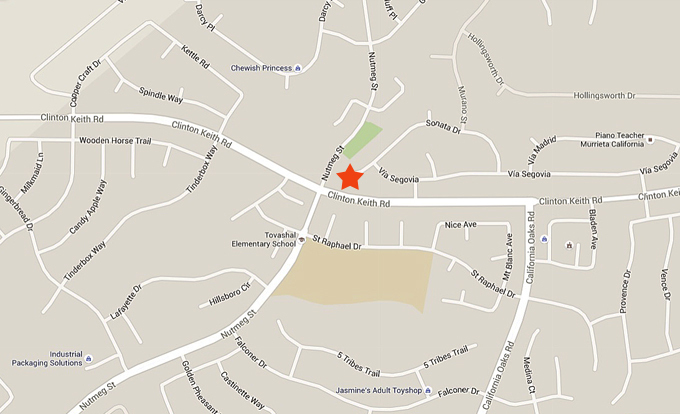 The incident occurred near the intersection of Clinton Keith Road and Nutmeg Street about 3:33 p.m., police said. A driver and front passenger were traveling east on Nutmeg from Jefferson Avenue when they noticed a vehicle ahead of them driving erratically. As the suspect vehicle passed Jackson Avenue, it continued to drive erratically and cut off several other vehicles. Moments later, the suspect vehicle was waiting at a red light at the intersection of Nutmeg and Clinton Keith, positioned to continue north on Nutmeg. When the victim vehicle made a right turn onto Clinton Keith Road, the suspect made a right turn onto Clinton Keith and pulled up next to the victim vehicle. Police said the suspect then pointed a black, large caliber semiautomatic handgun at the victims and fired. At least one round entered the vehicle, causing minor injuries to the driver. Then suspect vehicle then fled east on Clinton Keith Road. 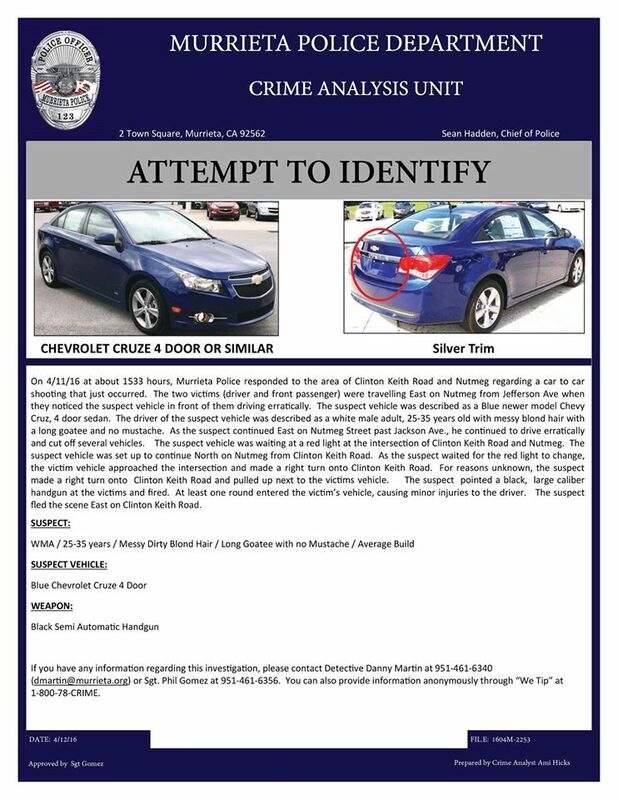 The suspect vehicle is described as a blue newer model Chevy Cruze four-door sedan. The driver is described as a white male, 25-35 years old with messy blond hair, a long goatee with no mustache. If you have any information regarding this investigation, contact Detective Danny Martin at 951-461-6804 (dmartin@murrieta.org) or Sgt. Phil Gomez at 951-461-6356. You can also provide information anonymously through "We Tip" at 1-800-78-CRIME.